Please state your callsign, name, locator, location, signal strength as either RST for CW or db for JT65B (e.g. -12dB), mode (e.g. CW or JT65B), date and time of reception and brief details of your receiving equipment and antenna. You may also add any comments. If you also wish to comment to the beacon keeper regarding any interesting cases of propagation that you have experienced in receiving the beacon, then please use the Contact the beacon keeper page. Your report which is considered very useful may also be forwarded to the RSGB Propagation Studies Committee. Please encourage others to send reports, and feel free to submit another report soon! Thanks very much. 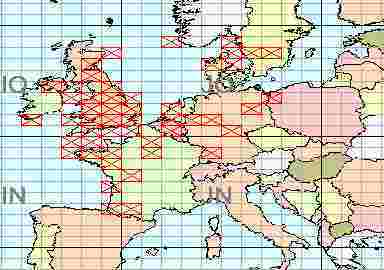 The map below shows the locator squares that we have received reception reports from. The map will be updated from time to time and more reception reports would be much appreciated please.